Enjoy an amazing day out on the water with this custom Intrepid 337 Walkaround power boat. With one large en suite cabin and lots of room to relax and experience the boat, cramped is definitely not what one would feel on this vessel. Intrepid boats are the leaders in the industry for producing fast, comfortable and sturdy boats that enjoy a smooth ride in chop that would have most boats slowing down. She is equipped with triple Evinrude E-Tech V6 outboards and reaches speeds of up to 45 Knots. The 11-foot, 6-inch beam creates a wide, workable cockpit for fishing, snorkeling, diving and other water sports with deep fish wells, side diving door, a transom door, dual dive platforms and two boarding ladders. Add the removable aft lounge and you have plenty of seating for cruising with guests. An L-shape settee is forward, and the low, raked windscreen combined with a full enclosure does a good job diverting the breeze or rain. The cabin has a full-size berth forward, a settee to port and an in-line galley and head with shower to starboard. The low-profile bow rail adds to the boat's looks yet is handy to grab when you travel forward on the wide side decks to lounge on the large forward sun pad. Whether you want to sunbathe on the sun pad or stay in the shade on the comfortable sofas there is room for everyone. 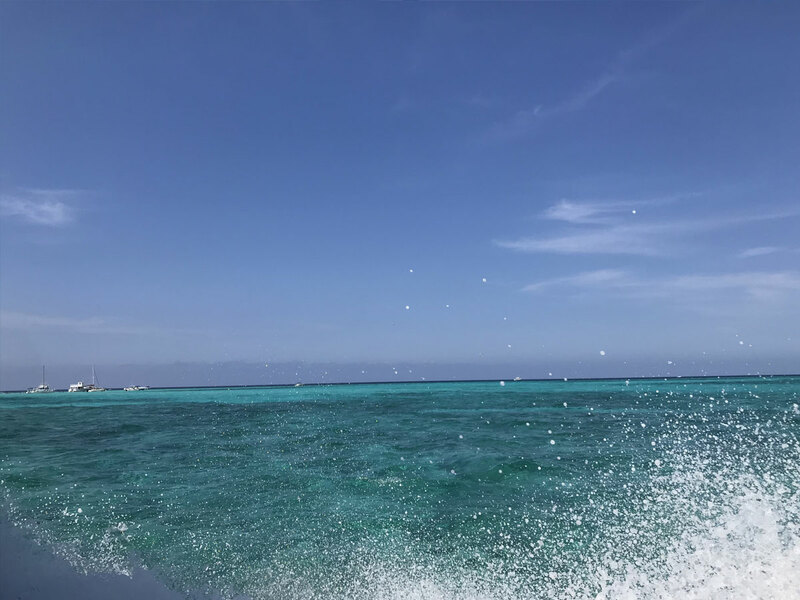 The perfect creation for a great boat day, whether you are looking to pop out to the sand bar, listen to some good music and enjoy a drink, or for a day’s fishing trip in the reef or deep sea! The crew knows the waters and this boat like the back of their hand and would love to welcome you on board! 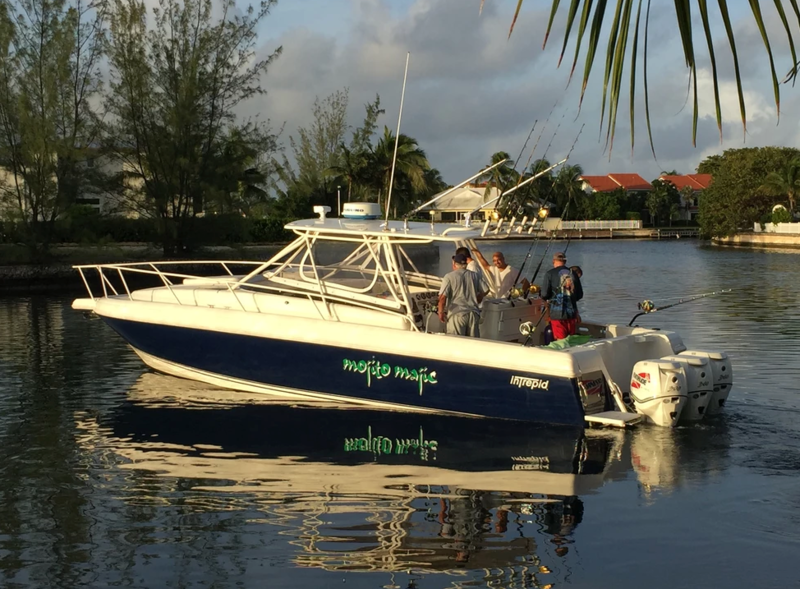 Mojito Majic is a beautiful fully airconditioned boat providing a smooth and comfortable ride in open water with its three 300 hp engines. Come on board and experience the beautiful waters of our island. 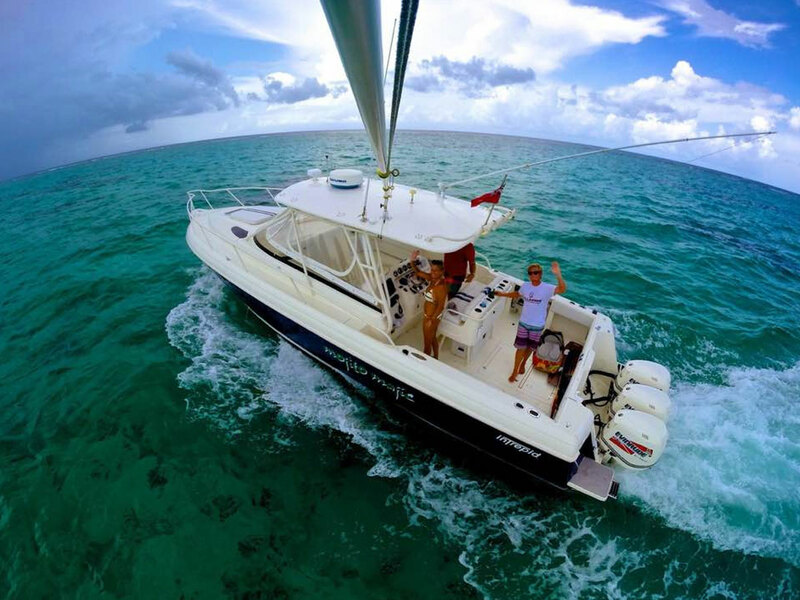 Whether it is a half day, our friendly professional crew can take you on your own unique experience which can include: cruising, snorkeling, jet skiing, tubing, reef fishing, deep sea fishing, Stingray City, Sandbar, Starfish Point, Seven Mile Beach, sunset champagne Cruise and more. Let us help you design the perfect adventure.